Architects Heneghan Peng and Kearns Mancini have been selected in a two-stage international competition to design the museum. Image courtesy of Canadian Canoe Museum. The Canadian Canoe museum will be an elegant, serpentine glass pavilion that will reflect the waterway in its curvaceous design. Image courtesy of heneghan peng architects. The museum will house the world’s largest collection of canoes and kayaks and will attract approximately 40,000 visitors. Image courtesy of Kearns Mancini Architects. A two-acre rooftop garden to be designed on top of the museum can be used for creating edible gardens. Image courtesy of Kearns Mancini Architects. A new Canadian Canoe Museum has been designed by a team of architects comprising Heneghan Peng and Kearns Mancini Architects. The architects were selected through an international competition, which was launched in early 2015 with winners being announced on 21 January 2016. "Ground-breaking for the new attraction is expected to take place in 2017 with opening scheduled for 30 months later." To be built at an investment of C$45m ($31.6m), the museum will be an ode to the importance of the canoes in Canadian history and house the world’s biggest collection of canoes and kayaks. It will also offer water-related programmes and activities at its new site. A planning submission will be submitted to the City of Peterborough and Parks Canada by the design team seeking permission to start building. Ground-breaking for the new attraction is expected to take place in 2017 with opening scheduled for 30 months later. Start of construction of the project is planned to coincide with Canada’s 150th anniversary celebration that will be held in the same year. The new museum is planned to be located at the Peterborough Lift Lock National Historic Site on the Trent-Severn Waterway, which will mark a relocation from the museum’s current address at 910 Monaghan Ave.
A memorandum of agreement was signed by Canadian Canoe Museum with Parks Canada to secure the historic Peterborough Lift Lock site. The new location will integrate two important regional destinations that serve as significant tourism and recreation sites. A water-based location will enable greater variety in the programmes offered by the museum and simultaneously increase the visitor footfall to approximately 40,000. The new museum is designed as a majestic, sinuous glass pavilion that will exhibit a two-acre rooftop garden. Located along the Trent-Severn waterway, the building will reflect the meandering waterway in its serpentine-like structure. Designed to highlight the significance of a canoe, the museum will offer resplendent views of the surrounding water from its interiors, open spaces and its rooftop. The building will be partially embedded in the ground to protect the light-sensitive 18th century collection of birch bark canoes and aboriginal artefacts from the sun’s glare. Natural dark spaces will be created within museum as only its east and south glass walls will be exposed to the sun. The museum will have a single-floor structure with flexible floor plates that will enable it to adapt to changing technologies and alter its offerings accordingly. Repeating or mirrored arches will create parapet wraps around the corners of the building, which will make space for an outdoor roof garden and open spaces below. A central ‘spine’ skylight has been integrated in the museum’s design that will extend from the front to the back. The overall structure of the building will be horizontal in its layout with entrances available from both the parking lot and canal. The wavy waterside structure will be constructed on an area of approximately 80,000ft² and will include a 17,000ft² dedicated exhibition space and a 20,000ft² of high bay storage that will be open for public. It will also include a 250-seat multi-purpose area for holding events and weddings. A restaurant, gift shop, toddler play area and artisan workshops will also be featured in the new facility. The museum will also display Trent Severn canal exhibition and provide different canal programmes. Aboriginal programmes related to watercraft will also be offered. The new museum building has been designed to meet LEED Gold certification requirements. 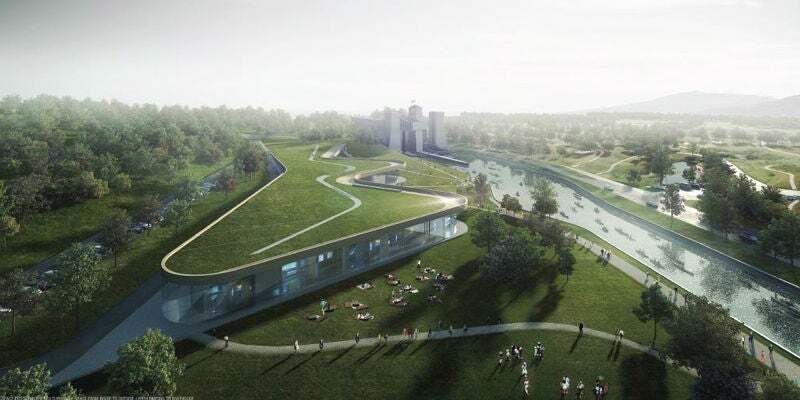 A number of organic features such as geothermal heating / cooling, a solar-shading canopy on the canal side, and a green roof have been embedded into the museum design. The spatial green roof can be used for nurturing edible gardens, native flower pollinators and aboriginal three sister plantings. It can also provide efficient storm water management. Locally sourced hardwood will be used to construct the building. Kearns Mancini architects have collaborated on the design of the project and will also be the architect of record. Arup will provide building services and structural engineering, while Foggy River Farm Design will be the landscape architects. Bartenbach will be responsible for the lighting design, while Kaizen will work on food service planning and design.